The glow and promise of raku! I know that this adventure is both taking its toll, and building us up. We’ve both dropped weight (though Rick is downright skinny and I’m beginning to bake goodies, to fatten him up a bit.) I have forearms like Popeye. I guess it’s making us stronger. Actually, I know it. We took a couple of days at Labor Day to go visit my Mum. She’s a potter and had weekend plans to participate in a raku firing event. 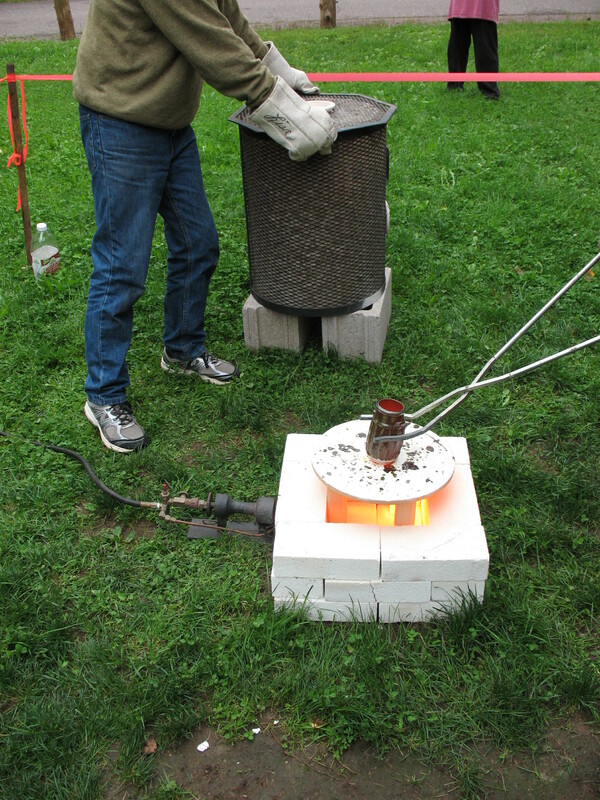 For those who may not know, a raku firing is a fire-filled, fast, somewhat ceremonial, blast furnace of a ceramic kiln firing. It’s a blast. From my childhood as a potter’s daughter, raku meant party. It combined the best of everything—fire, good food, a soupçon of danger, and that ooh-aah factor every time you open a kiln. Anyway, though I said that she’d need help with the event, I really just wanted to be there—to help and to live the fun that is raku. 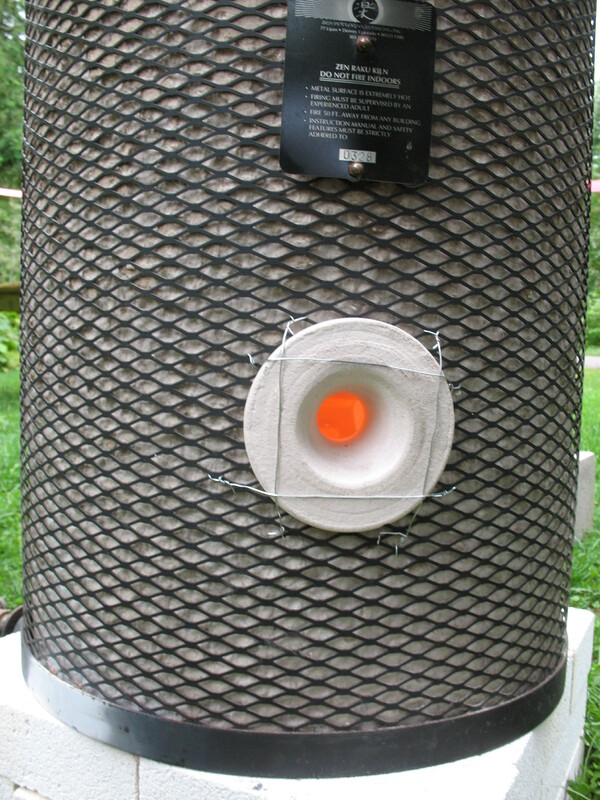 The fired pot–headed for reduction in wood chips. As we loaded up the truck (kiln, tongs, gloves, pots, and propane) I grabbed her two, small propane tanks. They felt empty. I hefted them again, two tanks at arms length, and and shrugged. I looked down. Lugging one tank is normally work—two tanks would not usually be within my capacity. So, I guess it’s true. What doesn’t kill you makes you stronger. It was a great firing and a great day. Good story. That’s how I felt when I had two toddlers who always wanted to be carried. Now, I’m a woos (sp?). Go girl! After my sister’s second child, she signed up for an exercise class. It was too easy. She complained. When the instructor heard she had two little ones at home, she said they never put moms in the beginner class–and moved her up a couple of notches. At this rate, I’ll soon be able to move mountains.